I got super excited when I saw the theme for the next recipe swap. Soup. Love in a bowl, in other words. I also got super excited when I saw Sarah’s recipe that I was assigned. Yum. Not that this week has been soup-friendly weather (um, hello 60 degree weather in February, NJ!) but really, is there ever a bad time for soup? And yes, I did add the unnecessary cheese on top. I suggest you do the same. Heat oil in a dutch oven over medium high heat. Add onion, celery, leek and broccoli with a little salt and pepper. Saute until onion is soft, about 10 minutes. Add flour and stir to combine. Cook for about 4 minutes. Gradually add broth to pot, whisking to work out any flour lumps. Bring soup to a simmer and and cook for about 45 minutes, stirring occasionally. Puree soup using a stand or immersion blender. Stir in lemon juice, add cheese, and season to taste. 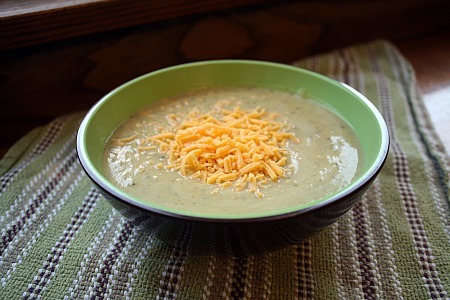 This entry was posted in broccoli, main dishes, soup. Bookmark the permalink. This sounds really good. Adding cheese is totally the way to go! Glad to liked it. This is one of our favorites and I especially love that it doesn’t have any cream but is still a creamy soup. I love broccoli! This soup sounds like the perfect idea! Soup is DEFINITELY love in a bowl in my opinion! This looks delicious!